This week, may 16th to May 22nd, we are including a free Mr Head figure with any $25+ order! Mr. Head is one of the Mechtorians, a steampunk-style mini figures series from the twisted mind of Doktor A & produced with care by MINDstyle. Toy2R developing a line of 18-inch Qee Pillows! 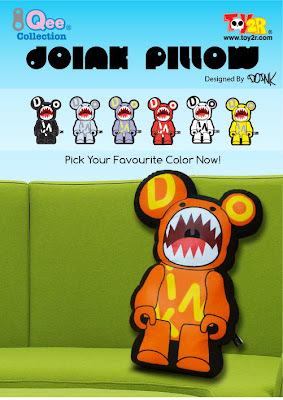 Coming soon from Toy2R are these fun 18" tall Qee pillows! The first lineup of pillows will be the popular DOINK Qee (above). 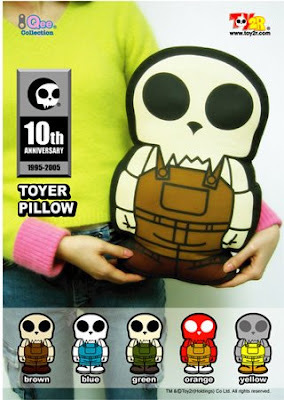 After that will most likely be a line of Toyer Qee pillows, and then who knows? Sky's the limit on this idea, with so many Qees out there. They are aiming to make the retail price around $40 each. Your furniture is sort of the last frontier for your designer toy collection... you already have toys all over your desk, bedroom, office and living room, plus the toy-related art on your walls. Why not stick a Qee pillow on your bed and another on the couch and just really, fully succumb to your addiction? Dropping early June is this very interesting and subversive 3" mini figure series from Kidrobot: Pure Trance by Junko Mizuno. Based on her manga book by the same name, Pure Trance deals with adult themes, so much so that it comes with some sort of adult content warning. Which makes it way cooler than all those Yummy Donut keychains you've been collecting lately. 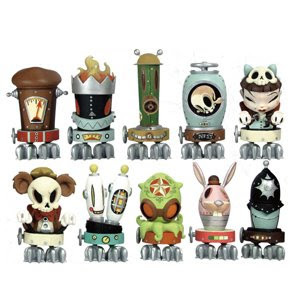 Arriving mid-July, the upcoming Brandt Peters Serv-o-Matic mini figures will be between 3.5 and 4 inches tall each. Will come blind-boxed, 15 to a display case. Click link to see ratios of each figure & to preorder! Chase is 1/30 and is by Kathie Olivas! Another mini figure series that will blow your mind. Thanks MINDstyle! Limited to 100 pcs. 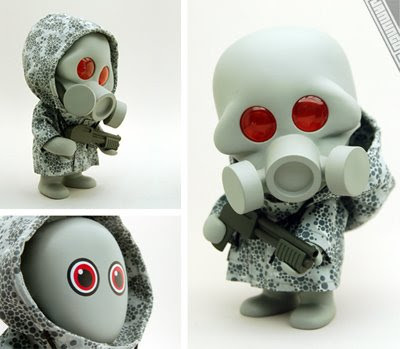 6" vinyl, includes '3dot' patterned camo parka, 2 sets of arms, weapon and removable helmet. This week we are including a free Thomas Han Slugworth figure with every order! Slugworth is Thomas Han's contribution to the Luke Chueh x Strangeco Vivisect Playset mini figure series. Thomas Han's artwork is offbeat and psychedelic and often deals with drug themes. He's a bit reclusive, or rather he doesn't do many interviews and has only a limited web presence, so I was excited to discover this interview with Thomas Han this morning while preparing my material for this week's free toy promo. Interview conducted by Jeremy Brautman of ToyCyte, who is always professional and thorough.